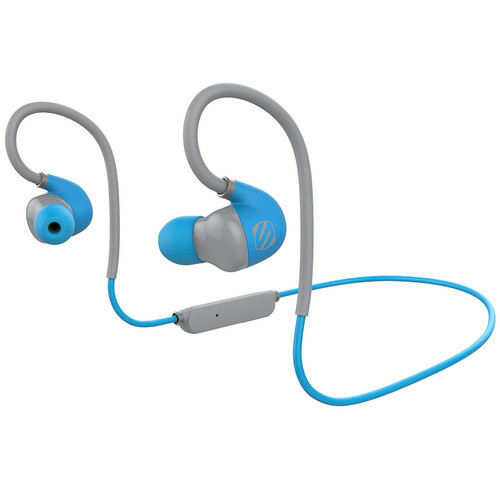 The blue SportclipAIR Wireless Adjustable Earbuds with Microphone & Controls from Scosche are bluetooth headphones that are designed to deliver premium sounds by way of high-efficiency dynamic drivers, to help active users stay motivated during workouts, trail rides, runs, and more. They are compatible with several portable iOS and Android devices such as iPads, iPhones, tablets, and more. The soft, bend-to-fit, flexible ear clips adapt to the contours of your ears and head. The wraparound cable design delivers a tangle-free listening experience and is splash and sweat proof. The antimicrobial earbud cushions provide a high level of bacterial and mold resistance. Furthermore, you get plenty of battery power for those extra-long workouts. The internal rechargeable battery runs up to 7 hours of playtime, and an integrated mic permits hands-free phone calls. Additional controls allow you to play/pause music, skip tracks, and adjust volume. Box Dimensions (LxWxH) 7.7 x 4.8 x 1.2"